I took a long, deep breath after I wrote that headline. A sadness filled my heart. My fingers typed extra slowly as my mind debated whether to even continue with this article. This is such a delicate subject. This past month my family was touched by the suicide of someone close. Close enough that she had recently visited our home and our children played together, often over the web. At the time of her death I had debated writing about it and had opted not to. Just too raw of a subject for us all. Today I had a long conversation with a very close associate who plays an important role in my writing. She too had recently been impacted by suicide and we spent an hour talking about the deep pain, the rich lessons, and the open questions we both were experiencing. It was a conversation that freely mixed tears, philosophy, and the kinds of real-life spiritual questions we are all asking deep inside. I have been pondering why suicide carries such a charge. Death, in all its forms, is difficult to digest. Regardless of our beliefs, when someone leaves the physical body there is a very real mourning to be done. Despite our lovingly articulated eulogies of better places, peace and rest, we miss and mourn people who pass on, which is part of the beauty of the human experience. But suicide is different. It brings with it so much more than mourning; it’s more intense and … it’s so personal. That’s what I want to discuss today: the personal aspect of suicide. First, let’s take some more deep breaths together and get into a space of safety and connection. We are in this together. The answer to the question I posed above about the intensity around suicide is, for me, that suicide forces us to confront the reality of our relationships with others. It makes us stare head on into the incoming traffic of our minds and face the truth that we are making each other up. The I that I am to you lives only in your mind, and while we may agree on names and adjectives and other words to describe me, the I that I am to someone else is totally different because that version of me lives only in their brain. This goes on and on and on. All of us making each other up based on our own unique perspective. And then a suicide. When a friend takes their own life we are left with the devastation of death AND the devastation of realizing that our version of our friend wasn’t the same as theirs. We are angry, self-righteous, and confused. We call them selfish, we wonder why they couldn’t see the love we held for them, and we question if we ever really knew them at all. And, I believe, all of those questions and feelings are 100% totally right. We are angry because they weren’t who we said they were. We are self-righteous because they didn’t see things as we did. And we are confused because their version of themselves didn’t match ours. They were selfish — 100% totally being exactly who they thought themselves to be and that didn’t match our thoughts. In fact, the truth is we never really knew them and we never really know anyone — we just know the part we know … the part that lives in us. That paragraph above is a reality we don’t often like to face. It’s so much easier to go along with the stories in our head and never move outside its comfortably familiar boundaries. So when someone shatters the story we are flooded with the emotions, questions, and confusion that makes suicide so difficult to process. Late last year I participated in a spiritual conference in Australia. As the conference drew to a close, I watched a panel of spiritual leaders discuss the separation of matter and spirit. One by one the panelists shared their views until the microphone arrived in the hands of an elderly Tibetan Buddhist monk. I was familiar with this monk from studying his work. He had, on two separate occasions, sat in meditation in a cave for two years straight. He cleared his throat and began by saying, “For us Buddhists, we always have to start by acknowledging that this all, including each of you, might be a product of our mind …” In other words, we are all making each other up. When a monk at a spiritual conference says this we listen, maybe contemplate the idea for a while, and then it’s lunch time and we go eat. But when we are confronted with the real-life manifestation of those words, it shakes us to our core. And that’s what suicide is. On top of all the pain of death, this extra-added smack in the face of our made-up reality makes it really difficult to deal with. To ease the pain we often open ourselves to the possibility that our loved ones are in a better place — a far off space of peace, love, and acceptance. Depending on your tradition we have different names for this, but the sentiment is the same: that those who have passed live on in a peace not experienced in the physical. Today I invite you to allow for an additional thought. The idea that the better place is in you. 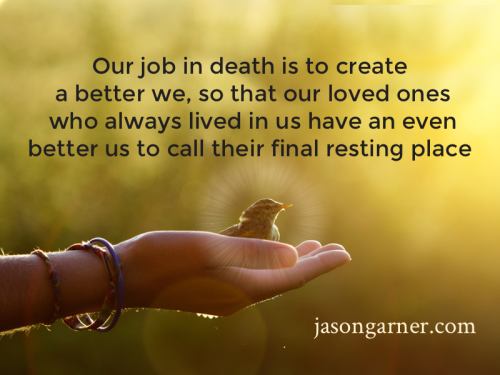 That our job in death is to create a better we, so that our loved ones who always lived in us have an even better us to call their final resting place. Allow this time of mourning to be a process of growth, of new discovery, and of an increased opening of your heart. And in that extra space allow your loved one to rest, peacefully … in your heart. In every death there is a birth. Today is an invitation to allow that birth to occur in you — a birth of renewed love, understanding, and openness. In this way our loved ones live forever. In this way they never leave us. And in this way, they are closer now than ever. What a great article. I also experienced a suicide years ago. My MIL chose to take her life leaving behind 5 girls 8-17 alone whose father had left years ago. My husband and I took in the girls and I lived the devastation that each one of them including my husband, suffered in their own way of blaming themselves and being so confused on why this happened. Eventually, we were divorced. This was a wonderful woman who helped so many and was the sweetest person in the world. She lived a life tormented by her family being Catholic that still felt she was married in the eyes of the church and not able to move on in her life because of it. We never know anyone totally inside and what they are feeling. My heart was broken because she didn’t feel worthy of love and living a life full of happiness. I will always remember her with love and know that it took a lot of courage to do what she did because she lived for her family. A person has to go to a place where there isn’t any hope to be able to choose this option. I love the thought that by making us a better “we” we can honor those that we have lost in this way. Thank you for taking the time to share your thoughts and feelings during such a difficult time. This article made me sad. I too at one time thought of suicide. I still from time to time wonder if things will ever make any sense. I dated a man for 9 1/2 years , love of my life! A beautiful relationship , with really only one problem. He drank a little too much. I tried to help him, supported the times I thought he was in AA. Went to his place one night to surprise him , and I met the OTHER WOMAN. I was completely devastated. Never , ever , expected a thing. He married her 5 weeks after I met her, and moved to Houston. I’m still in shock. After months of counseling the pain is so hard. There isn’t a day that goes by , that I don’t cry and question God. I wonder if I will ever Understand. Suicide ends a feeling in a person’s head and heart which becomes too heavy to carry. Unfortunately, a life is ended too. Hi, I’m so sorry for your loss, Jason. I had a friend who committed suicide a year ago. I also recently met a woman who lost her son to suicide not long ago (He was bipolar). But it wasn’t until a recent personal bout with severe depression that I understood how someone could take their loife. I don’t think most people committing suicide are “selfish.” Not in the sense that we think of that word as something bad or mean. I think they are depressed, hopeless, perhaps mentally ill (at least at the time of their suicide), tormented internally in some way. I have a 13 year old daughter, and that kept me from seriously considering suicide. but when i was in the depths of the depression, I got why people do it. It was like i was living in hell and didn’t know how to get out of it. I was scared I would always feel that way. It was hard to bear. I am finding my path now, with the help of an outpatient program, therapy, meditation and yes, medication. (Wish I didn’t need it but for now, I do). Again, so sorry for your loss. Reminds me of a conversation you, Christy and I had while ambling amongst the wall murals of SF’s Mission district….. the concept that with death, the living are charged with creating the best constructs of a lost loved one. It sheds light too on why the lost art of storytelling, passed down from generation to generation, is usually so colorful and heart filled. I can also share with you while the pain and confusion will never completely go away because as you said… we don’t really know what was going on inside the mind of others… it does get easier… and as a Father who lost the most precious gem in his crown… you hold the gems you still have with more care and reverence. Yours in healing, strength and love. I once heard that people dont die of suicide. They die of sadness and suicide is the only treatment option left for them. My wife of 21 years committed suicide after at the end of 5 years of mental health problems and several long enforced stays in hospital psychiatric wards. I was convinced at the time and still am that she took her life not to end her torment but to free me and our son from the trauma that was continually at the centre of our lives. In life, she was the most selfless, loving, caring person you could wish to meet , always putting others before herself. I think that she realised, in a moment of clarity in the midst of her mental fog, that she could give us one last gift – the freedom to get on with our lives. I have gone on to remarry and our son has gone on to all the great things we had hoped he would. I miss her every day. But I am so proud of her. She gave her life so that we could live ours. Not selfishness, not the easy way out, but a wonderful act of love for her family. Doesn’t the righteousness we feel when someone we care for commits suicide come about on account of our need to absolve ourselves of any guilt? We need to feel the blame is in their court; that they should have been stronger. So that we don’t have to feel we are at fault. But why is there so much emphasis in our society of guilt and of fault? Sometimes people are simply overwhelmed by despair and depression. Other times it might simply be one single moment’s worth of not having the courage to live out a painful situation. In any event, our society does put a lot of blame around the issue. Churches preach the one who commits suicide can’t be given a church burial, etc. It is not an easy thing to sort out. I believe that we are all in this together. For me, that means that each day we get up and do the best that we can given where we are at in life. Some days the result is joy and compassion and some days the result is flipping someone off on the road. And both are ok. Because that is life. And both give us an opportunity to experience and learn. Which, in the end, is how we grow. When you add suicide to the mix the guilt gets so deep, and seemingly unfixable because the person is gone. But, as I said in the post, I believe that our job in death is to create a better us so that we give our loved ones a beautiful resting place – which I believe is our heart. That means that our life’s journey is an opportunity to grow not only for ourselves but for our loved ones who have already passed. Guilt prevents that growth and so, with a lot of tenderness, we learn to let go of the guilt and welcome life as it occurs. The slap in the face that suicide brings – the not knowing. The struggle and the determination to make sense, to piece together events, to KNOW, to understand. Our minds often cannot operate in a linear way around it, if it comes ‘out of the blue’. Our minds naturally want and need to do this. Your willigness to consider and explore the notion that we cannot really know another is I believe the ‘antidote’ to the struggle or at least the balancing, the compassion that will bring us close again to the person we have lost, and suddenly thought we didn’t know and distanced ourselves through this shock. It is the key element to being able to mourn, to share and to hold that person in our hearts. It is also a fundamental awareness that will enhance all our relationships, the one with ourselves as well. Congratulations on approaching this subject the way you did and what you bring. My father took his own life 32 years ago when I was 12. It has taken me a long time to ‘make sense’ and actually I can’t, it will change, it is a moving understanding, but the remembering I do not have to KNOW him or why or what frees me to connect to the essence of meaning and loss that I feel with compassion and love. Thank you. The words you wrote, Jason, were ones of insight due to the recent loss but also with your own beliefs from life and experiences. It is the way of each individual whose life is touched by suicide as they grapple with their own set of beliefs, shock, experiences with any loved ones with mental illness and as you mention guilt. Often the guilt may be the overriding emotion which then creates such confusion with the grief. Often it is advisable for the loved ones grieving to consider counseling. Even unsuccessful suicide attempts can cause many mixed emotions, disruptions within families and all the while hoping and praying there won’t be another attempt. When I was in my late 20’s, a close uncle attempted suicide but was ‘saved’ by excellent Emergency care. With my family background being the British attitude of ‘unless it’s normal look the other way and let’s not talk about it,’ there was a ripple of revulsion, a sense of the ‘act’ as being repulsive by all the other members of the family except myself. As the only RN in the family circle, I was fully aware of those reactions and felt they were not attune with mine. Although through an association which provided skilled counseling was offered through my efforts, after a first meeting it was rejected totally as not being helpful. All the while, my uncle was in a hospital Psychiatric ward refusing to speak to anyone and did not for 6 months during which time he escaped to be found two days later. During these months, while working in a high stress Open Heart Unit at a big city hospital, I was aware of a need for my own counseling and clear boundaries were necessary for myself apart from this family. I could not be the nurse in this situation and with counseling felt justified in maintaining those boundaries. I give this example because although the conversation about suicide is difficult, often when there is an attempted suicide, there often is not much discussion at all even with those closest to the person who is mentally ill.
My uncle during his first year post his suicide attempt did have many hours of counseling, was compliant about medication but sadly, his close family of a wife and two daughters in their teens, always treated him like he had ‘done’ this to them, embarrassed them with the suicide attempt and did so proving to them, especially the wife, that he didn’t love them. His recovery, to me, proved completely the opposite, but due to the dysfunction in the home, he didn’t maintain his good mental health and lived out his life really struggling with not getting severely depressed again. The support of his family could have existed had they been willing to have more education, more professional support for themselves, even while he was hospitalized. I was the only person in the family who on occasion was able to really talk to him and let him know I had empathy for his illness and loved him despite. The one question I had which caused me to cry on many occasions was the thought of what he did to himself must have hurt so much. He’d slashed his arms over 200 times with a razor blade but did not cut deep enough to hit an artery. When I did ask him after a long friendly talk which was 2 years after the attempt, he said there was absolutely no pain at all during the time of his attempt. This answer was his honest answer and I cannot tell you how his openness with me comforted me those years later. So, perhaps a lesson I learned is that whether a person commits suicide, or attempts, the love we have for them before this devastating act of harm should remain. The person we love, their goodness deserving of that love remains; it’s the mental illness which causes the suicide or the attempt. It’s not a lack of love for those who they love. If we can realize the love is not diminished, as I did realize with my uncle, it can still be even if the person is gone from our life, we have the memories of the goodness and the love which was shared and treasured. Maybe that can give hope to those, like yourself, who are left with so many questions. My uncle has now been gone, dying of natural causes, since 2009 and I am proud to know he never doubted I loved him dearly as his niece. OMG this passage resonated with me because my cousin passed last year….and I really learned from it. Just to be a better person and give more love to those around me.